Montana Trout Wranglers - Are you a technical fisherman? First of all, the camera in my iPhone is just as good as my expensive waterproof point-and-shoot camera I bought a few years ago. It is easier to use and at the end of the day I can send those pictures directly to your phone or email address with a press of a few buttons. One app that I have purchased and use often is called FastCamera. You can take bursts of pictures instead of one at a time. It works great for capturing the moment. Just shoot away and erase what you don't want. This app is great for taking many pictures quickly so you can get the fish back in the water. What else is your smart phone useful for? Well, the app that I use everyday to find stream levels, weather and sun and moon charts is called Fishhead. It isn't free but well worth the money. When you fish as many different rivers as we have here in Bozeman, Montana, you can get a lot of information in one spot by using this app. Another app that I use often is Weather Underground. 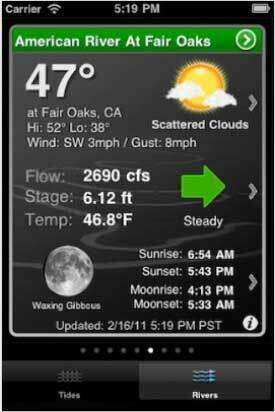 This free app is a weather specific website that I can input various points along the river and check the wind as on big western rivers such as the Yellowstone. The wind may be blowing 25 mph on one end of the river but calm 30 miles downstream. Very important information to insuring a good day on the river. There are also a few good apps that can be downloaded if you are in need of some help with tying knots. Animated knots by Grog is a great website if you need to brush up on any type of fishing knots or any other knots for that reason. The website version is free but the app for your phone does cost $4.99. They have animated instructions where you can control the speed of the video and commit any knot to memory. If you are concerned about dunking your phone in the water I have a great solution for you. The case that I use to protect my phone is called Lifeproof. Available online and at various stores such as Target, I have absolutely no worries about getting my phone wet. In fact the case is completely waterproof up to six feet, shock resistant and has a slim design. You can take underwater photos or videos and peace of mind during those afternoon showers or unexpected stumbles in the river. Priced around $80 it is well worth the cost to insure your expensive smartphone. So if you are so inclined, check out these apps and I believe that they will enhance your time on the river.